We are now on the third leg of our four-part series on Newark architects, beginning today's examination of this fascinating subject in the Ironbound section of the city's East Ward. John Jackson is believed to have been the architect of St. Casimir's Polish Roman Catholic Church at 91 Pulaski St. The edifice has been variously described as 'a hybrid basilica plan for Romanesque Revival, as 'one of the most unique religious edifices in the City of Newark,' and as the 'Basilica of the Ironbound.' St. Casimir's handsome windows are by Ludwig Van Gernichten. Its sanctuary has a seating capacity of 2,300. Josiah James was the architect of Trinity Church (Trinity/St. Philips Cathedral), which replaced the 1740s church destroyed by fire in 1806. Its colonial interior was later altered by Richard Upjohn, who added gothic arched windows and a cast-iron gallery. James was a Broad Street merchant, and Upjohn was one of the nation's leading architects of the 19th century. George Elwood Jones designed the Griffith Building at 605 Broad St. as 'a small-scale skyscraper with electric ornamentation,' according to Donald Geyer, whose papers detail Newark's architectural gems. His 12-story Academy Building in Italian Renaissance style had 'dignified fine vertical lines with strong Roman arches.' Jones, who also designed the Riviera Hotel and the Colleoni Apartments, served as consultant for the city's housing authority. For that effort, he received a 1929 award of merit. Another 'outsider' who designed some of our best buildings was Patrick C. Keely of Brooklyn. He gave us St. James Roman Catholic Church in the Ironbound at Jefferson and Lafayette streets and St. Patrick's Cathedral, later Pro-Cathedral. The former is now a parking lot, and the latter under restoration as a national landmark. To many, St. James was needlessly lost in an Irish and Portuguese parish dispute, despite its stature as one of the greatest churches ever built here. Its 235-foot spire, the second highest in the city except the Basilica/Cathedral, gave the great brownstone the nickname 'Cologne Cathedral of the Ironbound.' Its 21-foot rose window shone down on a church population that was one of Newark's largest in the 1860s. 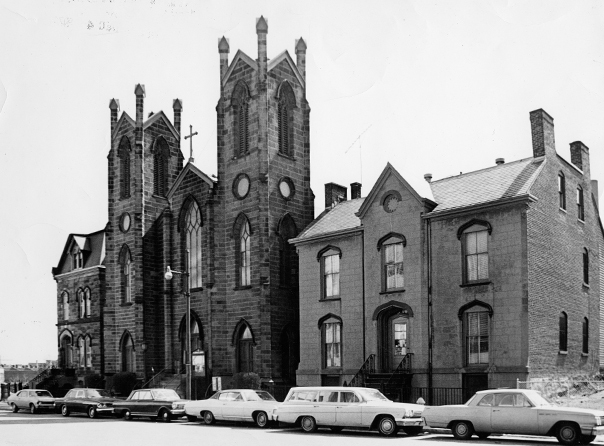 At the time, the great new brick church became a symbol of the rising importance of Catholics, especially Irish Catholics, in 19th century Newark. By 1846 when the walls began to go up, the building had become a testimony to not only a new religious presence in town but to an accompanying political permeation. William Kirk, born in 1813, worked in Newark for several years beginning as a carpenter's apprentice. He later became an architect. His best-known Newark building is North Reformed Church, with its brownstone tower facing Broad Street at the north end of Washington Park. In the 1930s North Reformed was severely damaged by fire. It was rebuilt and is one of the string of architectural pearls in the necklace of Newark churches. Minard Lafever, one of the nation's best-known architects, was born in Morristown, lived briefly in Newark, and designed the Central Methodist Church, which later became First Methodist. Lafever's book on church architecture, 'The Young Builder's General Instructor,' was written when he lived in Newark. Warrington G. Lawrence designed the mansion at 718 High St. (Martin Luther King Boulevard) for beer baron Christian Feigenspan. This impressive, and last, High Street mansion remains to this day in private hands. The Lehman family ran one of the greatest local architectural firms in the city's history, said to have designed more than 5,000 buildings here, around the country and overseas in the more than 50 years they were in business. William E. Lehman Sr. was born in Newark in 1874 and died in 1951. The family-run company included a brother, sons and nephews. At first the company concentrated on individual residences, but in later years turned its attention to industrial and commercial projects. Of the many important structures designed by Lehman, some of the best-known are Goerke's Department Store, the U.S. Trust Building, the Progress Club, the Alderney Dairy, McCrory's Five and Dime, the Borden Dairy, Temple B'nai Abraham, and the massive U.S. Post Office and Federal Court House. 1100 Raymond Blvd. also was one of their buildings. Charles McKim of McKim, Mead and White, considered one of the most important architectural firms of its time, designed Newark's Pennsylvania Station. The city's National Landmark Register railroad station was opened in the 1930s as the third railroad station to be built on that approximate spot, and around it has revolved a good deal of Newark architectural history as well as economic development. Eight hundred trains essential to Newark's economic well-being passed through or stopped in the city at Penn Station each day. A recent series of restorations of the art deco interior highlight the station's modern aluminum doors, heavily carved and inlaid waiting-room seats, terra cotta and metal inlaid flooring, elegant lighting fixtures, and a historical transportation frieze around the ceiling of the main waiting room. By the time Penn Station was built, McKim's classical style had already been established at the great Boston Public Library and Pennsylvania Station New York. The Newark station was one of the firm's last major projects in a long series of American monumental designs. Harold van Buren Magonicle was architect of the Essex County Park Commission building, 1914-16. This building near the Cathedral of the Sacred Heart on Clifton Avenue is a three-and-a-half-story structure designed of Flemish bond with a red metal tile hipped roof and a terra cotta cornice. The building was created for the county's and nation's oldest park commission. A recent refurbishing has highlighted many of the building's original delights. Harry B. Mahier, chairman and chief executive officer of the Grad Associates, died in November 1998. In addition to planning the Continental Airlines Arena, and more than 2 billion square feet for major corporate clients throughout the state and region, he was adviser for several historical projects, including the Edison Museum in West Orange, the Gold Association facility in Far Hills and the Krueger-Scott African American Cultural Center in Newark. Mies Van der Rohe, an internationally known architect who was born in Germany in 1866 and died in Chicago in 1969, designed Newark's Colonnade Apartments in the late 1950s. One is on State Street, one on 7th Avenue, and the other, a great double building, on Clifton Avenue. These great glass towers have been described as 'pure Miesian design' and were intended to attract middle-class residents back to the city. Rev. Patrick Moran, co-architect along with Keely, of St. Patrick's Pro-Cathedral at Central Avenue and Washington Street, would be proud of the architectural restoration going on in the Gothic structure with its 50-foot spire. Moran also was responsible for the design of St. John's Church opposite the New Jersey Performing Arts Center. Morris and Davis designed the 16-story 1910 skyscraper on the northeast corner of Broad and Market streets, at 786 Broad St. Its white terra cotta limestone and white brick facade with a large cornice is early neo-classical. It was originally designed as the Firemen's Insurance office, but that company withdrew many years ago. Barton Myers was selected in 1990 to produce plans for the New Jersey Performing Arts Center. He was selected for his views about 'beauty and permanence,' 'festiveness and happiness' and desire to see 'people feeling good about themselves in their city.' He also wanted to 'create a symbol that would speak to the 6th-grader and the people who demand world-class performances.' At the end of the first year of operation, more than a half million people attended the performing arts center. Nathan Myers designed Temple B'Nai Abraham in 1924 at Clinton Avenue and South 10th Street. Its classical green modified-oval dome is a community landmark as are its Ionic columns. For many years it was home of Rabbi Joachim Prinz, president of the American Jewish Congress in the 1930s. Myers' other buildings include the Hamilton Building on High Street, the Court Street Theater and St. Anne's Villa at Convent Station. Jonathan V. Nichols designed the Newark fire tower at Catherine and Shipman streets, a cast iron structure 125 feet tall with an enormous 6,000-pound bell, the largest in the state. Civil War photographs usually included views of the prominent structure. Nichols was also responsible for the construction of several fire houses, such as the Excelsior Hook and Ladder Company No. 2 at Washington Street. Jeremiah O'Rourke was one of those blockbuster architects who has had lasting influence on his adopted city. Born in Dublin in 1833, he died in Newark in 1915. During his lifetime he designed a great number of Roman Catholic churches in New Jersey and New York. O'Rourke closed his Newark office in 1893 to move to Washington, D.C., where he became an employee of the U.S. Supervising Architect. He returned here in 1900 and practiced in the city until 1911. O'Rourke created the original plans for Sacred Heart Cathedral in 1898, which was finished by I. E. Ditmar and Paul C. Reilley with work by Ralph Adams Cram and Gonippo Raggi. It was completed in 1954. The masterpiece, which rose 260 feet – higher than Westminster Abbey or Notre Dame – was deemed 'one of the greatest cathedrals of the Western world.' One of the six largest cathedrals in the United States, it is of the French Irish gothic style. O'Rourke's other important Newark buildings include St. Joseph's Roman Catholic Church, St. Michael's Hospital, the Dominican Convent, St. Mary's Parochial School, the House of the Good Shepherd and St. Aloysius Roman Catholic Church. In 1826, the Rev. Gregory Pardow, a well-known English Norman perpendicular gothic designer of his day, used a relatively austere facade, once decorated with elaborate pinnacles, to beautify the face of St. John's Roman Catholic Church, New Jersey's oldest Catholic Church. Fred A. Phelps designed the Eagle Fire Insurance Co. at 16-18 Washington Place opposite Washington Park. The building is now home to St. Philip's Academy. Henry Polemus of Polemus and Coffin was responsible for the handsome 21-story Military Park Building at 60 Park Pl. It is composed of masses of varying heights. Designed to look like a castle with its crenelated crown, the tower faces Military Park. Poor, Swanke, Hayden and Connell of Manhattan designed the new $65 million skyscraper of reflective insulated glass on the site of the previous PSE&G building of 1916. The 26-story structure was the first in a series of buildings to rise in the downtown area since the construction of the Prudential building in the late 1960s. George S. Post and Sons of New York City designed the first PSE&G office and terminal building, the Howard Savings Institution on Broad Street, and the original group of Prudential 'castles.' The Terminal Office Building was completed in 1916 and enlarged on several occasions. The front entrance was eight stories with an addition of 16 floors in the rear that included a penthouse. Built in the Italian Renaissance design, the downtown office landmark was called 'powerful and dignified and marked by five bold archways.' The original cost was more than $5 million, which included basement rail tracks and platforms for two subway lines. It was originally designed to relieve the tremendous trolley congestion at Broad and Market streets, considered 'the busiest trolley intersection in the world' at the beginning of the century. John Hall Rankin (1868-1952) was senior partner of the firm of Rankin & Kellogg, 'one of the most successful Beaux Arts firms in Philadelphia. In 1897, the firm was commissioned to design the present Newark Public Library building. It opened in 1901. The library was the first of the great public buildings commissioned by city officials and today houses the state's largest public library system. Its Italian Renaissance design is one of the city's most pleasing. The heavily decorated nine-bay three-story facade is complemented by its interior three-story atrium. The library's great Centennial Hall on the building's second floor is decorated with hallmarks of the great printers, rich red velvet draperies, parquet herring-bone floors, and flanking wood- burning fireplaces.